I grew up in a messy house. My mom would have rather played with us kids than clean. I can remember making tent forts, having floor picnics, tea parties, and even playing Pilgrims and Indians on my parents’ bed (the bed was the Mayflower… LOL). I would rather play with my kids then clean. There, I said it. Its public knowledge. My husband and I disagree on this– very often. Now, I’m not saying there’s trash on my floor or anything like that. I just would rather play cars and trucks or Barbies than dust. Heck, you could probably write Barbie in the dust on the mantle. 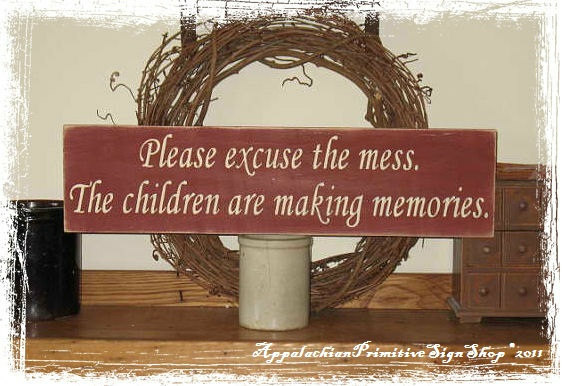 It doesn’t bother me one bit for the kids to “help” cook or bake and the mess be everywhere throughout the kitchen. It’s more important to me for the kids to enjoy themselves, learn, and grow up happy than it is to have a showcase, immaculate home. There’s time for that later. I used to be a nutcase about cleaning. When my father-in-law would come to visit, I would clean the house top to bottom. I finally mentioned this one day, and he replied “I’m family. You don’t need to do that.” I stopped. I figured if the man could stand in the operating room and watch my c-section, he could handle a little dust and cob webs. My husband, on the other hand, will clean before playing. He hits the house and immediately washes the dishes the kids and mom used during the day. On Saturdays, we have a cleaning blitz… vacuuming, straightening up, etc. You know, I’d rather watch cartoons and hang out with the kids… but, I do help. A few months ago, I found a sign on etsy that I loved. I am going to try to find one similar when we go to Amish country in the fall. It just fits the situation perfectly, doesn’t it? So, when you come to my house… my kids are making memories. And, will hopefully grow up to be well-adjusted, happy children. Of course, it also might make them the next Martha Stewart. I’m not sure that would be a good thing.